Meet the very enterprising Mouna Abbassy, the founder and creative head of Izil, a brand new beauty range from Morocco. In a cut-throat marketplace where brands come and go, Izil stands out from the crowd and has created a special niche for itself by offering high-quality organic beauty products that are based on authentic, age-old Moroccan beauty traditions. Mouna has lived and worked in the UAE for over 9 years, has a strong marketing background, and her stint as the regional brand manager for a global beauty brand encouraged her to rediscover her Moroccan roots and create the uniquely beautiful ‘Izil’ range. All Izil products are based on age-old Moroccan beauty secrets that have been passed down from generation to generation, and the key ingredient in all these special ‘recipes’ is the highly prized Moroccan Argan Oil. Today, Mouna gives us an insight into the creation of the Izil brand, and shares some of her own beauty secrets. What motivated you to leave the safety of a desk job and try out your own venture? Entrepreneurship has always been in my blood and I have always dreamed of creating something of my own thus, the motivation has always been there. Plus, having lived in an international city such as Dubai and discovering so many different cultures made me value my own culture and heritage, therefore, I decided to realize two dreams at once: building my own business and serving as an ambassador for my beloved country. You have a strong background in marketing; surely this must have helped you immensely in launching Izil? Definitely! Working in marketing for global companies for over 9 years taught me how to effectively manage brands on all aspects of the 4 Ps (products, price, promotion and place). Do you have a background in the cosmetics field, especially organic beauty? I have worked in the past for one of the biggest cosmetic companies as a regional brand manager. This experience gave me an understanding about the market of cosmetics in the GCC. Also, I am currently studying cosmetic science at the UK Cosmetic Science Society, which is a 1 year intensive program on the development of cosmetic products, both organic and non-organic. Please share advice for someone interested in pursuing a career in the field of beauty. The field of beauty is extremely competitive and in constant development. It requires a lot of energy and speed to stay up-to-date and to always be ahead of the game. Thus, my first and only advice would be: do it only if you’re passionate about it! Only passion can give you the required strength to keep going and growing. Argan oil has to be the best kept beauty secret to come out of Morocco, but it has only received media hype in the recent years. Why is this so? Dubai residents rarely visit the Burj Al Arab, New Yorkers rarely visit the Statue of Liberty and Parisians rarely visit the Eiffel Tower because they grew up used to their presence but when tourists go there, they are impressed with those monuments. My guess is that it is the same with Argan Oil. We Moroccans grew up with it as a commodity and it was only recently that it got the attention of renowned skincare specialists who saw the huge benefits of this oil. Today, many of the big Hollywood stars like Kate Perry, Salma Hayek and Scarlett Johansson use the Argan Oil as part of their beauty regimen. Argan Oil is extremely rich in vitamin E, antioxidants, and fatty acids. It helps repair damaged skin, clears acne, skin blemishes and sun spots, relieves itchiness and dryness of eczema and psoriasis, repairs damaged hair and gets rid of frizz and split ends and reduce stretch marks. You can even apply it to baby’s skin to treat dryness and soothe redness. But I personally think that the best benefit is that it is suitable for all skin types. Whether your skin is oily or dry, it will be healed thanks to the regulation of the sebum production. It wasn’t called “the miracle oil” for no reason! How has Argan Oil been traditionally used by Moroccan women? Argan oil is used in many ways by Moroccan women from including skincare, hair-care and cooking. They use it as a moisturizer especially in the south where the weather is dry and to treat some minor skin damages like sunburns, itchiness, etc. It is also used in cuisine. Fresh bread dipped in Argan oil with a glass of Moroccan tea is the best breakfast I know. How can we differentiate from pure Argan oil and the many counterfeit oils in the market? There are 4 ways to differentiate the pure Argan oil from the counterfeit. First is the smell: it has to be light and nutty. If the smell is strong and does not disappear after few minutes from the application, then it is not pure. Second is the texture: the pure cosmetic Argan oil is easily absorbed by the skin and does not leave a greasy residue after application. Third is the bottle: the bottle has to be either dark or made of insulated material to protect the oil from the UVs. And finally the price: Argan oil is the rarest oil in the world and is still extracted manually and this comes with a price! Thus a minimum price for it would be around 25 to 30$ for 100ml. Tell us the story behind Izil, and how you created this unique brand. It goes back to 2009 when a friend of mine and I started exploring the possibility of bringing Moroccan beauty products to the UAE. We did a lot of research and even created a brand. But I had a very stressful job and she moved back to Morocco so we just abandoned the idea, until 2012 when my son, Youssef was 1. My job was less demanding and we had some disposable cash to start. I spoke to my husband about it and he immediately agreed and encouraged me as well as my family back home. My late father, may he rest in peace, helped me with the name as he spoke Berber fluently (he was a native Berber from the Atlas Mountains). I did a lot of the creative work in-house, I even bought photography material for the product shots and took online courses to use it! The logo, the packaging design and the brochures were done by different freelancers in Dubai, Morocco and Pakistan to save costs. At the same time, I had to find reliable suppliers for formulations, packages and labels and I started the process of registering the products with Dubai municipality. It was a lot of hard work, sleepless nights and juggling between my day job, my personal life and Izil but it was worth it. Thank God, I have a very supportive family who picked me up whenever I needed it. Izil, pronounced –E-zeel- is a Berber word that means “pure”. The Berbers – or Amazighe – are the original inhabitants of North Africa and I wanted to pay a tribute to my origin and my father’s family by staying true to my roots. What makes Izil different from other brands? We are a brand who brings ancestral skin care recipes from Morocco to every woman in the world. These recipes are not about applying a product to enhance the appearance, they are about rituals that you can enjoy and that will bring out your natural beauty. Take the Moroccan Bath for example, it is a highly relaxing and enjoyable experience that repairs your skin from the outside aggressions (pollution, dust, sun…etc) and brings out a new and fresh skin that will make you naturally beautiful. This is what Izil is all about. How do you come up with all the various Izil concoctions? Are they all based on traditional Moroccan beauty regimes? All Izil products are inspired from traditional Moroccan Beauty regimes and fine-tuned with advanced cosmetic science to make them easy to use and answer today’s woman’s needs. For example, I have always seen my mother prepare her Ghassoul Clay Masks at home; drying the clays, rose flowers and other spices and herbs and then mixing them all together. Now Izil does this for you in a more sophisticated way to ensure long term stability of the product and its safety. 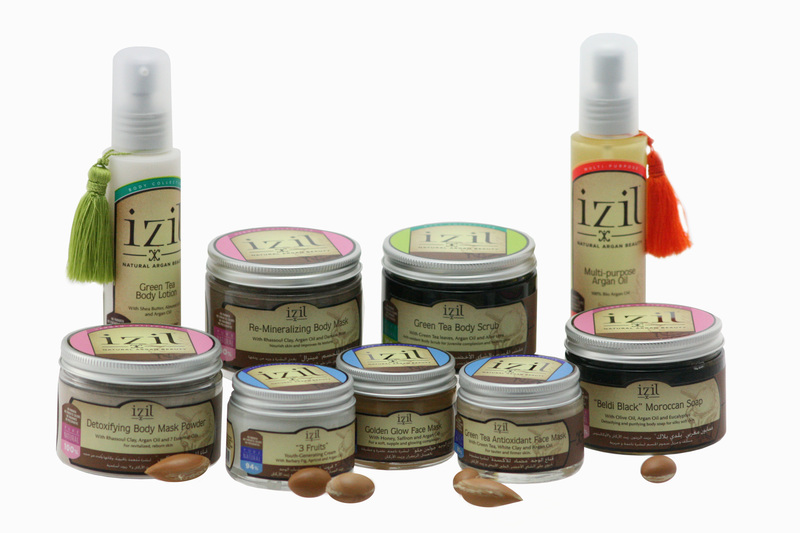 Which Izil products are your personal favorites? That’s a very difficult question as I worked with an equal passion on all of them! If I have to choose, I would say the Golden Glow and the 3 Fruits Cream for the face, the Re-mineralizing Body Mask and the Green Tea Body lotion for the body and, of course, the Multi-Purpose Argan Oil for a daily use on my hair, body, face and nails. You have a beautiful complexion! What is your beauty regime? Please share some tips and tricks with us. That is very kind of you, thank you very much. I should think that my products have a lot to do with that as I use them regularly. On a daily basis, I use Rose water to wash my face in the morning and I apply Izil “3 fruits Youth Generating Face Cream”. While in the night before sleeping, I usually wash my face with Argan Oil soap and I apply Argan Oil on my face while massaging. I also use the pure Barbary fig seed oil for under-eyes. Also, I do a Moroccan Bath once a week at my favorite spa where I take my products. It starts with warming up the body and the face with hot water, applying the Beldi Black soap with Eucalyptus on the body, and then scrubbing with a loofah to peel off the dead skin. Then, I apply the Golden Glow face mask (which works both as a mask and a scrub) and the Re-mineralizing body mask and leave it for 10 to 15 minutes. It is so relaxing that I usually snooze during that time! After washing it off, I apply the Green Tea body lotion and the Argan Oil on my hair, and I go home for a night of relaxing sleep. Thank-you very much Mouna for introducing us to Moroccan beauty traditions, and for giving us this gorgeous brand Izil! Read more about the Izil range on their website, and let me know your feedback! Posted in Beauty Insiders, Expert Tips, People, Product Reviews and tagged Beauty, dubai, Dubai beauty, marketing, moroccan bath, moroccan beauty, morocco, natural beauty, organic beauty, UAE. Bookmark the permalink. That’s a very inspiring story of a lady entrepreneur!! Also this post gives a great insight into Moroccan beauty products and regimes! Thanks Bilna, Mouna is inspirational indeed! I need to try out more from this lovely range. Would like to know where in Morocco is your outlet?